The Short Version: Arctic Kingdom arranges remarkable expeditions to the Canadian Arctic for people who want to get out of their comfort zones and see rare sights in the North. From kayaking with narwhal to watching polar bears roam the sea ice, couples can share many heartwarming moments while visiting a remote destination alongside experienced guides. For nearly 20 years, Arctic Kingdom has taken hundreds of people to icy expanses where polar bears and other animals roam free. You can take a sled ride to get a close-up look at the abundance of wildlife at the floe edge, or you can kayak on the water to see if you can spot the elusive narwhal. Arctic Kingdom’s expedition leaders and local Inuit guides do all they can to make your journey comfortable, safe, and enjoyable. By taking an Arctic Kingdom expedition, couples enjoy a once-in-a-lifetime experience surrounded by the breathtaking beauty of the North. Not many people can say they’ve stood on the ice in the Canadian Arctic and seen a polar bear walk by or a narwhal glide through the water. This untamed setting isn’t the typical vacation spot, and that makes every moment all the more memorable for those who make a trek up north. Arctic Kingdom facilitates moments of wonder and beauty for travelers from around the world. 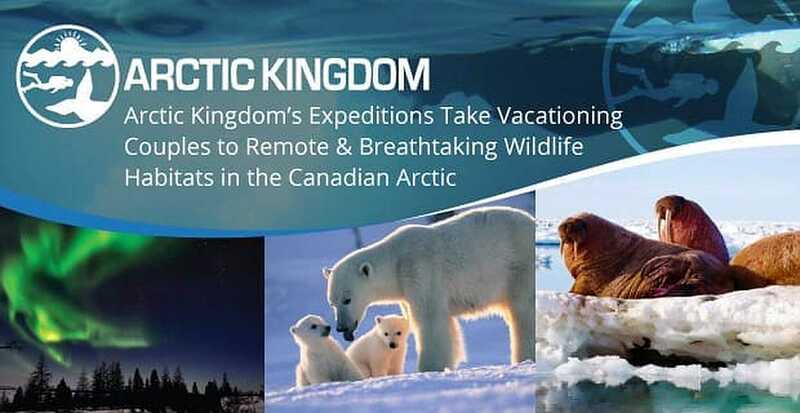 The knowledgeable team guides people to the Canadian Arctic and provides them with comfortable lodging, gourmet cuisine, and a close-up look at glaciers, icebergs, polar bears, narwhals, and other unforgettable sights. These one-of-a-kind tours serve around 300 people every year. Men and women of all ages come from every corner of the world to see the Canadian Arctic. When you travel with Arctic Kingdom, you have the chance to explore a tranquil and unspoiled part of the world. The landscape and icescape is breathtaking, but the wildlife is what draws many travelers to the Arctic. Opportunities to see arctic animals in the wild don’t come around every day, so you can create special memories with a loved one during your voyage. The Narwhal and Polar Bear Safari offers an exclusive chance to see the elusive narwhal — aka the unicorn of the sea. This springtime excursion is great for first-time visitors to the Arctic because everything is provided — from the campsite on the sea ice between Baffin Island and Bylot Island to the Inuit-led journeys to the floe edge where narwhals are known to roam. You can also experience 24 hours of daylight, which means plenty of chances to snap a well-lit photo. Polar Bears and Glaciers of Baffin Island is another tour that offers an up-close look at polar bears. Liz called this tour “our most well-rounded experience in the High Arctic” because it allows people to explore the Arctic by land and by sea with activities including hiking Auyuittuq National Park and kayaking among icebergs. The mild weather conditions mean couples don’t have to bundle up too much to spot polar bears and bowhead whales in the wild. The Great Migrations of the Northwest Passage is a popular tour package because it takes travelers to the Arctic during the seasonal migration of the beluga and narwhal to their summer feeding grounds. The eight-day trip transports people to a yurt-style camp on 2.5 meters of solid ice. Like all of Arctic Kingdom’s excursions, this safari includes gourmet meals featuring local ingredients such as caribou. While Arctic Kingdom’s trips do take you outside your comfort zone, they aren’t very strenuous. If you can walk the distance of a football field, you should be able to keep up on these excursions. People as old as 80 have gone on a trip to the Arctic. Many have wanted to see this part of the world their whole lives, but they only have the funds and time to make the trip in retirement. In 1999, Graham Dickson traveled north to dive into the Arctic Ocean. He felt captivated by the beauty of the Canadian Arctic and decided to make it his mission to help others journey North and see this vast and spectacular wilderness. He started Arctic Kingdom to give people a chance to experience the Arctic habitat and fall in love with its exquisite scenery. Over the decades, Arctic Kingdom’s team has built strong relationships with the local communities and supported a growing tourism industry in the area. Many knowledgeable Inuits offer their guidance to the expeditions. The Inuit people have lived in the Arctic for thousands of years, so they bring a lot of value to the voyages. Whether taking people to see the Northern Lights or to dive under icebergs, Arctic Kingdom strives to make incredible Arctic experiences more accessible to adventurous singles, couples, and families around the world. By leaving a small travel footprint and working closely with local Inuits, Arctic Kingdom’s passionate team hopes to make a positive difference in many traveler’s lives for years to come. Arctic Kingdom’s expeditions expand your horizons by taking you to places far outside the norm. It’s a rejuvenating experience you can’t find just anywhere. Many people come away full of unique stories about seeing polar bears, traveling by sled, learning from local guides, and experiencing a natural winter wonderland. A lot of Arctic Kingdom’s travelers end the trip feeling eager to go on another adventure. You can read dozens of traveler stories on Arctic Kingdom’s website. People love to gush about their exceptional experiences in nature and encourage fellow adventurers to book a trip to the arctic tundra. An Arctic Kingdom expedition offers an unparalleled experience in nature. You can ride across the ice on a traditional sled, catch sight of a polar bear or a whale in its natural habitat, sleep in a campsite on the ice, and spend days of sunlight in a pristine icy landscape. The locally sourced cuisine and Inuit guides add to the authenticity of the travel experience. It’s a unique opportunity to immerse yourself in the Inuit culture and take a vacation that far exceeds the typical romantic getaway. You can snuggle up with a loved one in the Arctic and appreciate rare sights, including close-up encounters with wildlife. This is a once-in-a-lifetime type of experience, which makes it all the more special for couples. Memories of being together in the North can warm people’s hearts throughout their lives.